Before I knit this, I would never have dreamt of wearing something like this, but now that I have it on, it is surprisingly snug and warm, and I think I will wear it into college today! Last Friday, I was feeling really yucky, but not yucky enough to want to stay in bed, so I decided to cut my losses and go to The Wool Shop in Bray. (I did write about the bus journey: don’t get the 45 bus!) Anyway, here’s some of the loot I came back with. Twilley’s have come out with a new line of wool called ‘Spirit’ and really good pattern support for it (for once). 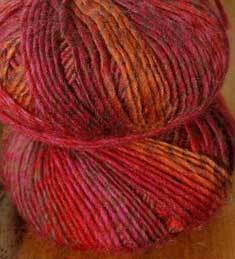 It is not outrageously expensive and the colourways are lovely, really autumnal. I got six balls of this stuff, and a pattern for a vest. I hope I’ll have enough left over to make a hat (because you really shouldn’t need six balls of anything to make a vest). Next up is this Rowanspun DK. I couldn’t resist the colour. Check out the little blue flecks! I’m not into buying just one skein of something because it won’t get used, but what convinced me about this is the fact that each skein has 200m. That’s pretty good for just a fiver. I’m thinking possibly socks, or even a One Skein Wonder. Lastly, because I was freaking out about not having enough wool to finish my Kid Classic shrug, I got some Jaeger Luxury Tweed. This has better meterage than the Kid Classic (180m to a ball – impressive, no?). Now that I have finished the shrug, however, I’m wondering what to do with these guys. 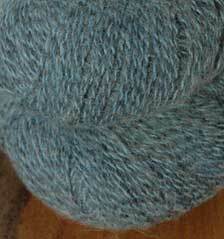 It is DK weight, as opposed to the Aran weight of the Kid Classic. I could just knit a vest with it or something. Vests are very handy. Still, it won’t go to waste. 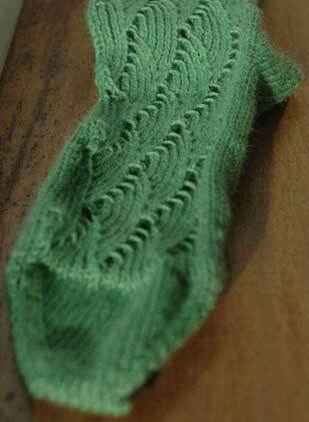 Lastly, because I know better than to venture into a hospital without knitting, is my first green Pomatomus sock. Unfortunately, the queue was really quick – I was only waiting for about fifteen minutes. But I didn’t have far to go to finish this one off, so I got it done yesterday evening. I had to pop into the Mater (only a fifteen minute walk! I left an hour too early… but good to know the next time I set my hair on fire or something… it’s happened before you know) for a blood test. My blood was pretty dark. My initial reaction was that I’m low in iron, but my mum is just after texting me and according to my dad, it’s from having too much iron. I can’t win. Results in a week! I know this is cheating a bit, but who cares, it’s finished! I haven’t pressed it though, which is why the neckband isn’t behaving itself. Check out my Granny Smith! Needles Used: 3.25mm for the hems and 3.5mm for the body. Adjustments Made: I made the sleeves full length. I just cast on the given amount and knitted for about four inches more than the pattern said to. Sideline Seam Cheering: Cheryl. We got there in the end! I wasn’t happy with the way my buttonholes came out, so instead of sewing them up a little tighter, I got my trusty crochet hook out and crocheted around them. It formed a really sturdy hole, much better than my sewing would have. Buttons are thanks to Cheryl and friend from the Saturday knitting group (sorry! I don’t know you’re name!) who came along to Ruban’s after the group and helped me pick out the perfect ones. Aren’t they great? I probably would have finished this on Saturday instead of yesterday, but I was overcome by exhaustion and spent most of Sunday just sitting. My mum was pretty worried when she came in on Sunday night so I went to the doctor yesterday. I have had a problem with total exhaustion for over a year now. It leaves me open to lots of little infections which is really annoying! So I am getting some blood taken tomorrow and I’m hoping it will come back with either thyroid or iron problems. Fingers crossed for thyroid, because then not only do I have an explanation for why I get so tired, but also for why I can’t control my temperature! I get really, really hot when I’m moving about (eg playing piano) and then deathly cold when I stop moving. I spend a lot of my time putting on and taking off my jumper. My mum and her sisters have thyroid problems so it won’t be a surprise. Mum said it’s easy to help as well, you just take a tablet a day and it’ll slowly start to regulate it. Mad how one dodgy gland can wreck your life! I’m just glad I’m getting it looked after. And here’s a lesson not to knit when you’re feeling tired and run down! 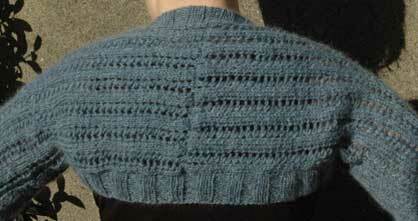 I started this shrug during the week. The construction is very straight forward. You knit two sleeves. Leave some stitches on a holder at the arm pit to pick up later for the neck band. Continue on knitting until you reach the centre back. 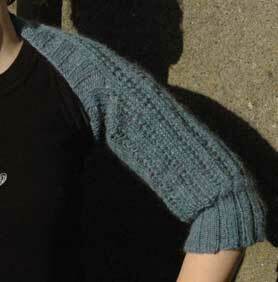 Repeat this for another sleeve, then seam the two together at the centre back. The joy of this is that you can keep trying on and knitting until you get the right length. Great if you have orangutan arms like me I had been knitting away like a house on fire during the week and mustered up some strength on Sunday to finally seam the two together. The pattern, from the first issue of Knit Today says to use a three-needle bind off, but I prefer to graft so I got out my big needle and got going…. until the very end of the needle… when I realised I had three stitches too many on one side, and the pattern didn’t match up at all. Not even close enough to fudge it. Solution? Rip both of the sleeves out! Sigh, here we go again. The good news is that I only had to rip back to where I had the stitches held so I have the first sleeve rectified, and I’m hoping to get the other one done tonight. I have to teach this afternoon but hopefully I will have some energy left when I get in. Nice colour, eh? The pattern called for 4 balls in this shade of Kid Classic, and I could only find 3. I freaked out when I realised that it’s a discontinued colour, but I think I’ll get through it. I have nearly an entire ball left to do the neck band, which is just plain 2×3 ribbing all the way around. I tried it on when I had most of it grafted together and it is very snuggly! I can’t wait until it is finished. Unfortunately, no FO for Friday this week. Maybe today. I seamed the sleeves of Granny Smith yesterday and I couldn’t take any more sewing. I still have to seam the body and set the sleeves. Sigh. 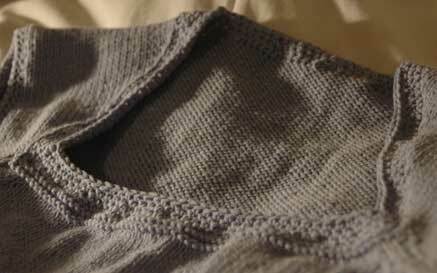 I am definitely knitting a top-down seamless raglan next. I’ve had enough of this needle and thread business. Yesterday, I woke up with this thing in my chest. I couldn’t take deep breaths and it hurt when I bent over (not that I do that much, mind). By lunchtime I was very groggy so I called it quits on the work. I was dozing in front of the news when I realised that I would still be sitting there by the time Richard and Judy rolled around, and I had to get up and do something! So I looked up some bus times, packed my bag, and off I went to the Wool Shop in Bray. I initially regretted not lugging my camera with me, but it was so dark and rainy that there would’ve been no point anyway. The shop! It is really tiny but packed floor to ceiling with Rowan, good Tivoli (like that great alpaca sock yarn they do), Regia, Jaeger, the new Sirdar Sublime stuff, cross-stitch kits, embroidery stuff, tapestry stuff, buttons, and millions of other things you can sew on. There was wool that I was hoping to be there, but I also found that the colour of Kid Classic I’m using to knit something with has been discontinued… and I need another ball of it. Considering the sort of day that was in it, and how I was feeling, I’m glad I went all that way and had a good poke about the shop. I stayed snug all day and am feeling much better this morning. Let me tell you this though: if you, like me, have a Rambler bus ticket and refuse to fork out more to take the Dart, do NOT take the 45 to Bray! It insists on going through every single village on the way. Granted, I now know what Shankill and Cabinteely look like, but I was doing well without! On the way back, I got the 84. I didn’t pay alot of attention, but we passed UCD after only 20 minutes, and within another 20, we had zoomed around by the RDS and were back in town. It is not as frequent as the 45, but definitely worth getting if you’re not going to get the Dart. I will post stash pictures and (hopefully) a FO picture later. I have been poking around and I’ve come across some interesting free patterns. If you’re one of those people that mops the floor, check out this for some Mason-Dixon inspired patterns. I am very taken with this attractive mohair V-neck. Perfect if you’ve got a few loose balls of mohair left over from something :} Lastly, if you love knitting gloves but hate the fiddliness of knitting fingers on DPNs, then check out these Sideways Knitted Gloves. You knit them from side to side, flat. I think it’s a good idea! I followed the link from this post on livejournal. Ok. Must run. I have to go look at a clarinet before I head to the Barnie’s Knit Meet Up later, and I actually want to get some work done before I go! The Hat goes on the Head! Indeed! I spent Sunday fighting off this horrible bug that was draining me of energy and making me run a high temperature. I finally feel back to normal, thank goodness, so allow me to show you the Birthday Hat. Pattern: Asymmetric Cabled Hat from One Skein. Needles: 8mm for the brim, and 6.5mm for the body of the hat. Wool: Debbie Bliss Cashmerino Chunky, 2 balls (only a little bit left over!). Adjustments: I added a brim and instead of making the top square and sewing the corners together, I did some dodgy decreasing to shape the crown instead. The brim was a bit of a challenge. I wanted the cables on the brim to match the cables on the body. Because of the nature of brims, and because I was knitting from the bottom up, I knitted the brim inside out and read the cable chart the right way (from right to left). 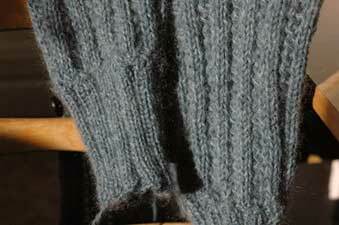 I thought that by knitting the brim inside out, the cables of the body would automatically match, but they didn’t. I solved this problem by turning the work and reading the cable chart the wrong way (from left to right). Dad’s birthday isn’t until Friday but I gave it to him yesterday and he loves it. Success! There has been interest in my see-through boots! This is encouraging because I was beginning to fear that I would get egged in the street :} Yes, they are funky! And! I have just discovered where to get them! My dad, when he returned from Berlin with them, told me that the woman said Raffia made them. I spent a long time googling this maker but all I could come up with were straw shoes. After searching for “transparent boots”, I was brought to Elann which stocks both rubber wellies and boots in sizes up to European 35 (about a size 4… technically childrens’ sizes!). But I noticed that the maker of these beautiful boots is Regia not bloody “Raffia”, which makes far more sense. So, googling for Regia transparent boots got me far more results. Here’s one that stocks adult sizes (scroll to the bottom of the page). I hope this helps! In other news, I recommend this month’s issue of Simply Knitting. I am very tempted by the wrap around cardigan on the front but I must resist! After two attempts, I must concede temporary defeat at the hands of the wrap around caridgan. It’s those frigging neck bands! The rest of the magazine is good too, though Speaking of magazines, check out this new one over at Hipknits. I’m curious! One of the contributors is Melissa Wehrle, the designer of Granny Smith. Which reminds me of one last item of news which is that the neckband of GS is complete and all that remains is to seam the sleeves and body, and find some buttons! Horray! It was a thoroughly enjoyable morning and I know Mary enjoyed herself too. A special word of thanks for the coffee and really special nibbly things baked up by Lisa and another girl who came. Jacqui very kindly sent some home with me and the verdict from here is that homebaked goodies beat shop stuff any day of the week It’s great to see the shop doing well and all the new stock they’ve gotten in, like the gorgeous tweedy yarn from Craftspun and the new Tapestry. When I got in, I was really in the mood for a bit of knitting so I got out my Alien Heads and decided to fix up that neckline. Now, I know it wasn’t apparent from the picture I took, but one side of the neckline was much more pulled than the other, and the front was pretty droopy. I ripped it out and crocheted two rounds, but it didn’t work at all; it was even worse. Third time lucky! I crocheted about four or five rounds, and decreased evenly all the way around on all rounds. I usually mess this up and it comes out puckered, but as you can see, it is finally wearable. No more droopy front! I’m going to miss working on this top. The Patons’ Washed Haze was very pleasant to work with and every now and then, I would put the top down and look at those alien heads, staring vacantly up at me. I feel like I’m wearing something that landed in my back garden from outer space. Today was a day of extravagances because I got all my knitted presents wool. This includes wool for my dad’s birthday present, my sister’s and Mum’s Christmas presents. 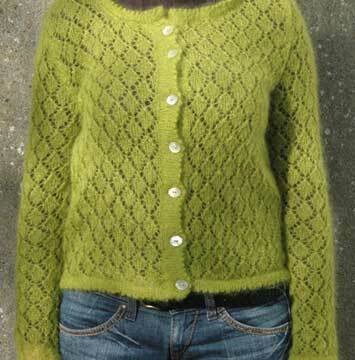 First up is some Debbie Bliss Cashmerino. 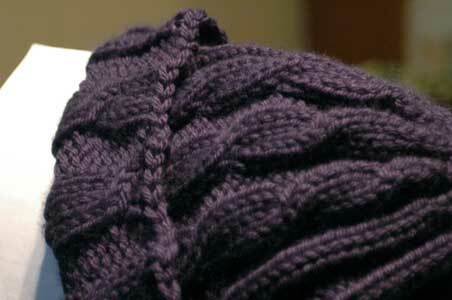 The navy is Chunky weight and is destined for the Cabled Hat from One Skein. Although I would have enough in one ball to make the hat, I am planning on adding length to it for a turn-uppable brim. That way, he can make it as long or as short as he likes. I’m thinking about those days when it’s bitterly cold and you want to pull something down over your ears. The red is Aran weight and is destined for a One Skein Wonder. I got two balls for it because I might make it a little longer, I’ll see how it goes. 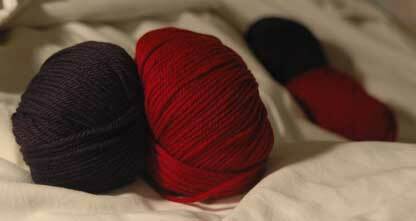 If I don’t need the second ball, I might knit another for a friend or my sister. This is destined for a pair of Fetchings. I’m not going to tell you who they’re for but I’m really looking forward to knitting them! It’s funny because I don’t want a pair of armwarmers, but I want to have a go at the pattern and try out the Tapestry, so I just decided to make them for a present Process knitter all the way! Here’s the Lorna’s Laces I got for Mum’s Christmas Clapotis. Not terribly original, I know, but I think the colourway will really suit her and, to be honest, I’d end up spending as much on a present for her anyway. 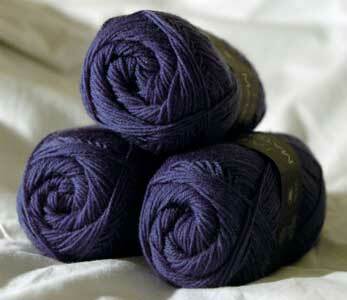 I really enjoyed working with the Lorna’s Laces I got for my own Clapotis so I’m looking forward to this one. So much so, in fact, that I’m going to keep it to knit in November, when the weather is miserable, clocks have just gone back and thoughts of summer are quickly disappearing. 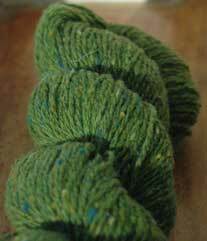 Lastly – I’m not entirely sure why I bought this today since I’m not in any rush to make it – some Jaeger Matchmaker Merino 4-ply. It’s for Rusted Root. 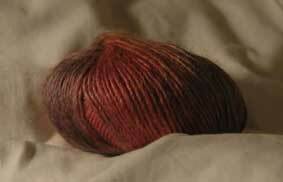 I have been thinking about this colour since I first saw it, and I think Rusted Root would really do the yarn justice. Phew! Next up: finishing my Granny Smith!